I’m writing to request that you deny the Badger Bluffs Sands’ application because of their stated plans to destroy unique and fragile natural plant and wildlife communities on their property in the process of developing their mine. This application proposes to destroy two possible bluff-top “Dry Prairies” (known locally as “goat prairies”) – habitat that is already under substantial pressure, unique to this part of the world, and a defining feature of our region. Destroying two prominent bluff-top prairies on two different scenic roads (Schoepps Valley Road and Oak Valley Road) is completely incompatible with surrounding land use. 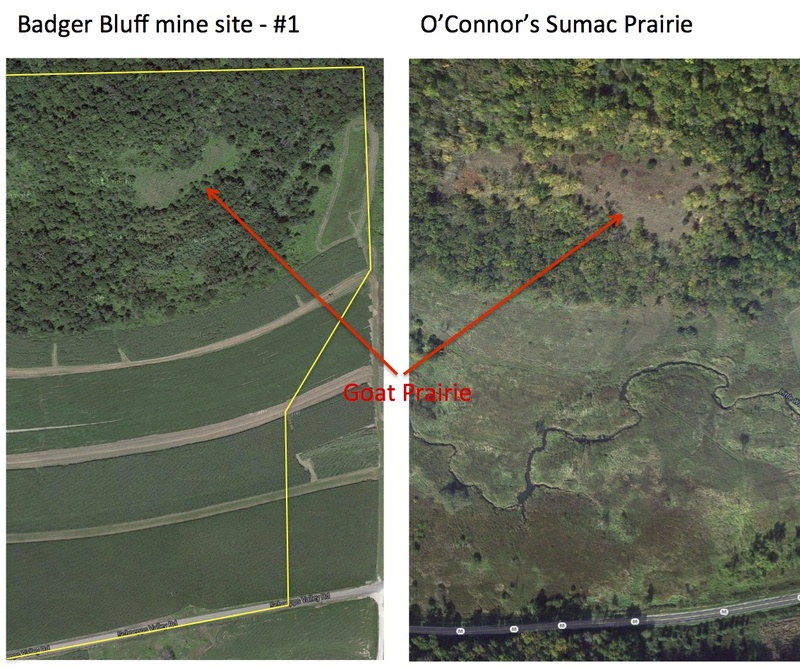 The “Biological Resources, Plant Communities and Wildlife” section of the Badger Bluffs Reclamation Plan is deficient because while it identifies that the mine site possibly contains two Natural Heritage Inventory Dry Prairie openings, no professional survey of that unique and fragile habitat was conducted. The Reclamation Plan is also deficient because it does not offer plans as to how Dry Prairie habitats will be preserved and protected during the life of the mine, and ignores the fact that once these habitats are destroyed they cannot be restored. The mine will be located in what is known as the ‘Driftless Area’; the name refers to its glacial history. The glaciers never covered this part of Buffalo County, and as a result it has rugged topography, and many unusual plants and animals. One of the characteristics of this geology is steep, sandy slopes on many of the south-facing points of land. These areas are identified as the “Dry Prairie community type” in the DNR Natural Heritage Inventory and are sometimes called ‘Goat Prairies’ around here. Because their soil is sandy and the hills are steep, water drains away from them quickly. Because they face south, snow melts quickly, and the sun beats down on them. As a result, they are extremely hot and dry in summer, and cold and dry in winter, so plants must have unusual adaptations to survive there. 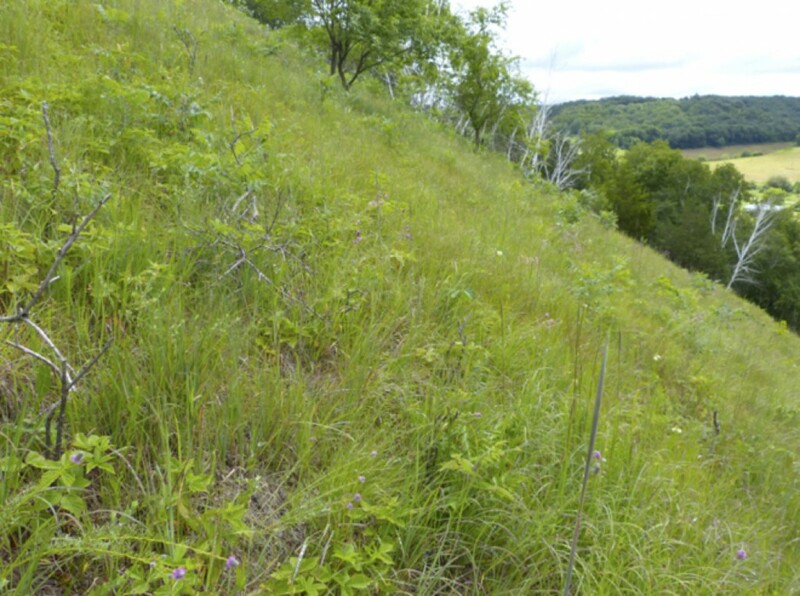 Goat prairies are one of the unique features of the Driftless Area, and of the landscape of Buffalo County. Each goat prairie is different – with its own unique mix of plants and animals. Dozens of plant, animal and insect species interact with each other to make up each of these rare ecosystems, and many of the species are rare or uncommon in other places. I am a naturalist and ecologist, with a degree in Botany and 20 years of experience restoring and managing native habitat. For the last 13 years I’ve been working to restore the prairie, wetland and savanna landscape on our Buffalo County property. Here are aerial photos of two Goat Prairies – one of the ones that will be destroyed by Badger Bluffs mining, and one on our land that appears to be very similar. These Google Maps images are at the same scale. The color variation is likely due to differences in the time of year of the imagery. Here are some closer photos of our goat prairie, and a list of the plants I’ve found there. Since the Badger Bluff Sands prairie is similar in size and also faces directly south, it probably has similar plant and animal communities. I haven’t done a formal survey of the insects on Sumac Prairie, but here are two unusual ones that I’ve seen there. Every year Golden Eagles come down from far northern Canada to spend the winter hunting on the goat prairies of the Driftless Area. The National Eagle Center in Wabasha conducts an annual winter count of these birds. Most years we record more Golden Eagles in Buffalo County than in any other Driftless Area county. During the 2014 count (on January 18, 2014) there were 9 Golden Eagles sighted in the count area near the two Badger Bluff Sands goat prairies (the snowy weather this year made it difficult to see the eagles – in the past they’ve seen as many as 26 in this same area). In most years the counters reliably see several Golden Eagles along Oak Valley road, and at least one pair of Golden Eagles in Schoepps Valley. If we destroy our Buffalo County goat prairies, these magnificent birds may not continue to come here. It’s unfortunate that the Natural Heritage Inventory ‘survey’ of the Badger Bluff Sands site was not conducted by actually looking at the plants and animals at the site. The reclamation plan states that: “No sightings of this plant [the rare Hill’s Thistle] have been noted.” But since no one with the expertise to recognize it has looked, it may be that that species, and possibly other rare species, are actually there. Because of the unique habitats and special nature of the landscape, a professional naturalist should survey the site to determine if any of these species occur there, and if these areas deserve protection. I know from my experience in trying to reconstruct the prairie areas on our land, that it’s impossible to replicate the complexity and diversity of those original remnants. Once a goat prairie is destroyed, it’s gone forever. Looking at these photographs, I try to imagine destroying them to put a mine in their place. Does that really seem like appropriate land use given the special nature of this beautiful landscape? Another issue is whether we want to change the character of the Buffalo County landscape. 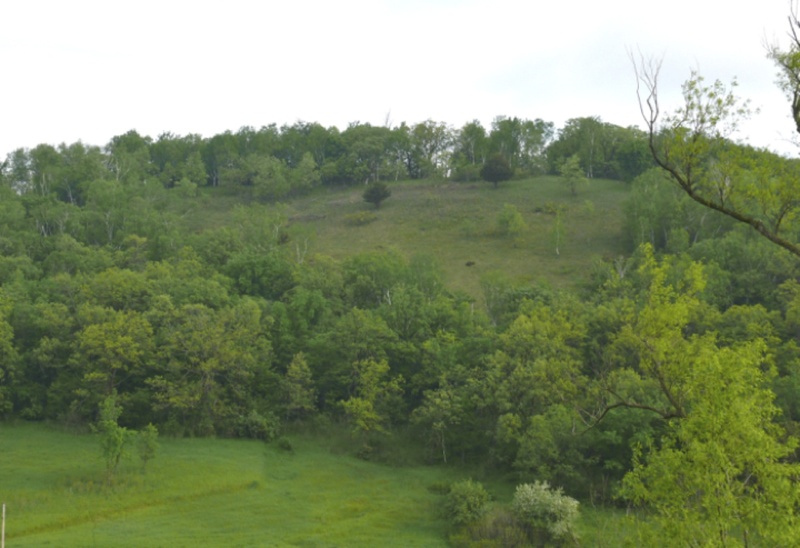 The driftless topography and vegetation make our county attractive to tourists and hunters. Both the goat prairies on the BBS property face scenic roads (Schoepps Valley Road and Oak Valley Road), so the mining activities will be visible to everyone. If we allow this to happen, we will begin to change the character of the countryside, making it less attractive for us to live in, and also to the visitors who support our tourist industry. Few tourists will be interested in driving on roads where they see mines, rather than wooded hills and prairies. Here is a picture of the Segerstrom mine on Highway 37. 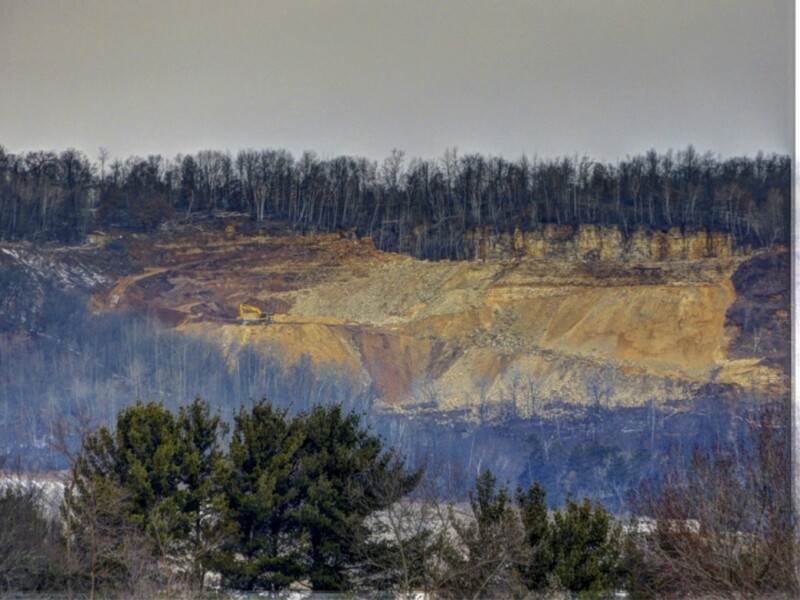 Imagine replacing two Dry Prairie openings with operations that look like this while the mine is in operation. And know for a fact that there is no way to replace that dry prairie once the mining is done. “A search of the National [sic – should be “Natural”] Heritage Inventory (NHI) listed two species that may occur in the wet plant and Phase I areas, which are the Mud Darter (Etheostoma asprigene) and the Bald Eagle (Haliaeetus leucocephalus). The NHI listed six species for the Phase II and II I areas, which are the Pirate Perch (Aphredoderus sayanus), Mud Darter (Etheostoma asprigene), Weed Shiner (Notropis texanus), Hill’s Thistle (Cirsium hillii), Dry Prairie community type, and Wood Turtle (Glyptemus insculpta). The NHI list and Wisconsin DNR information on each species can be found in Appendix D.
“The Pirate Perch prefers the quiet waters of oxbows, overflow ponds, sloughs, marshes, ditches, and the pools of medium to large rivers, with sand covered or soft muck bottoms and or ganic debris present. The Mud Darter prefers moderate currents in sloughs, overflow areas, riffles, and pools of large, low-gradient rivers over bottoms of mud, sand, gravel, clay, or bedrock. The Weed Shiner prefers sloughs, lakes, and still-to-sluggish sections of medium streams to large rivers, over substrates of sand, mud, clay, silt, detritus, gravel, or boulders. It is possible that these fish could be found in Schoepps Valley Creek, but there are no plans of impacting the creek to disturb them. Storm water management measures will be taken to prevent runoff from the mine site from entering the stream. “Hill’s Thistle is a state threatened plant found generally in dry prairies and oak barrens or in areas that contain dry, sandy soils. No sightings of this plant have been noted. “Bald Eagles are a state special concern (fully protected) bird. They prefer large trees in isolated areas within proximity to large areas of surface water, large complexes of deciduous forest, coniferous forest, wetland, and shrub communities. No nests exist on or near the mine site, but there are sightings of them in the vicinity as they hunt for food.